A photography order form is a prerequisite for a person running a photo studio or offering his services as a professional photographer. 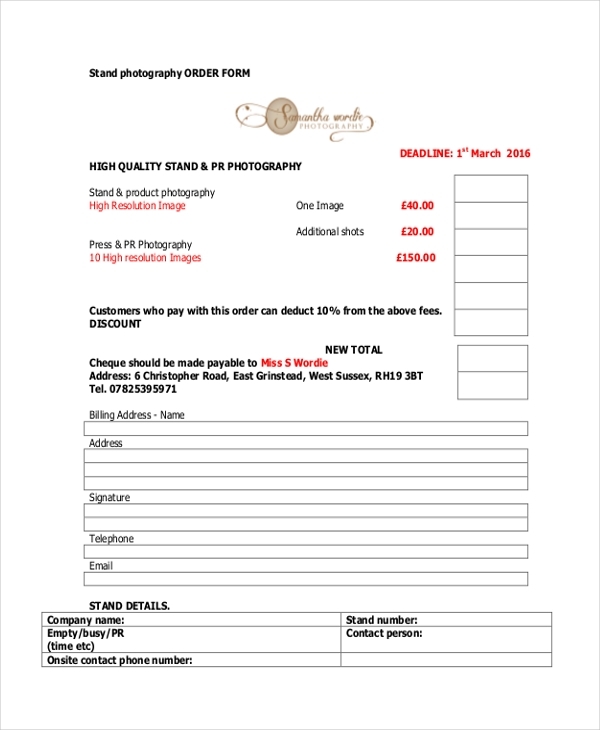 This form can be used by his customers to place an order for photographs. The form allows them to state the photograph detail and the number of copies needed. Thus, this makes it easier for the photographer to take prints of the required number and then deliver it on time. 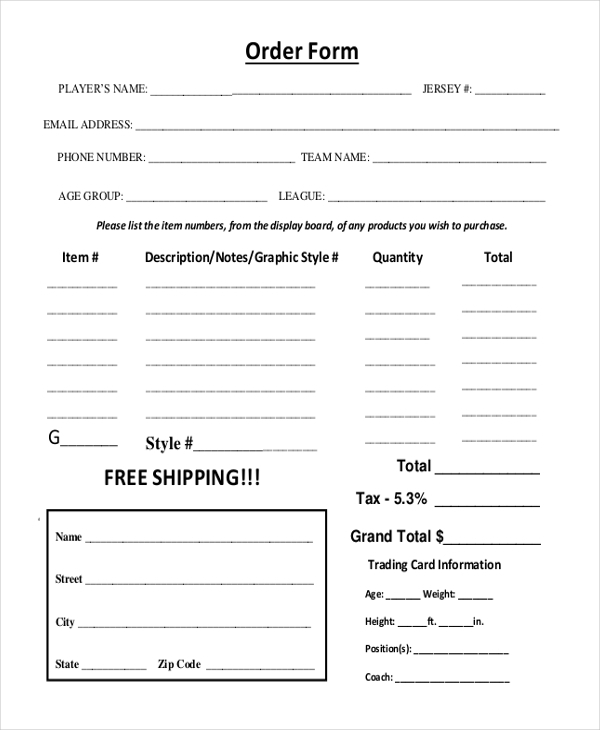 You may also useful Purchase Order Forms. Usually when a photographer is hired to cover an event, the clients may want copies of certain photographs clicked by him. By using this form, they can order the digital prints of these photographs. 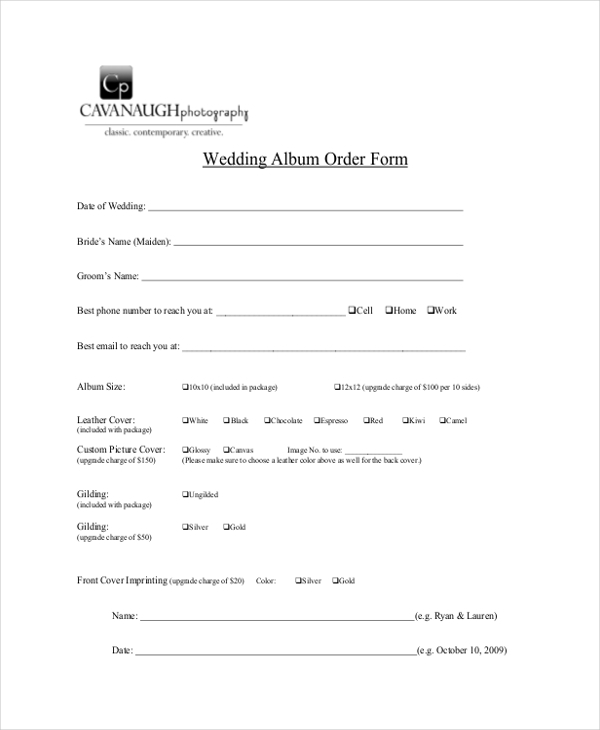 This form is used by a photographer who may have covered a wedding event to get order for the photograph copies that he may need to supply to the family members and the guests. Usually when a photographer is hired to cover an exhibition, he uses this form to obtain orders from the exhibitors who had put up stands in the event. They are required to fill in the forms with the details of photos and the number of copies needed. This form is used by a photographer to take an order from the school authorities where he might have been hired to cover an event. The school uses the form to place the order for different pictures along with the number of copies. 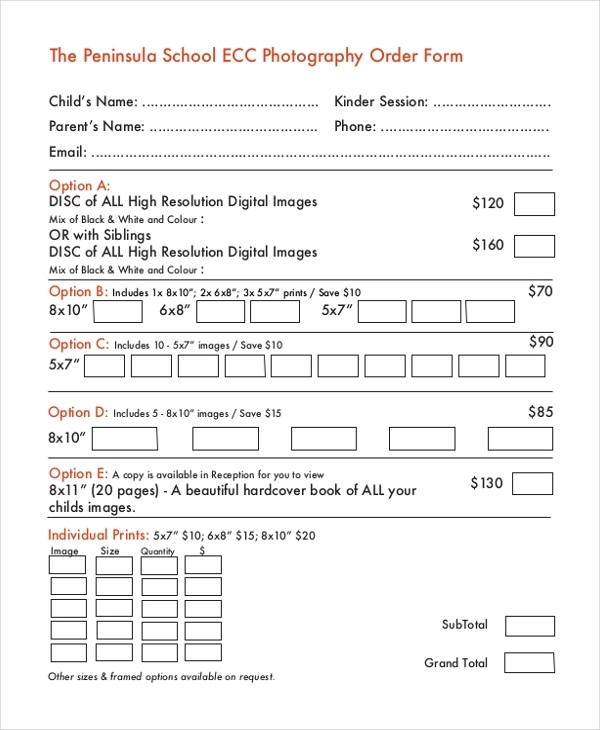 A photography studio usually uses this form to take orders from their customers for delivering prints of various photographs that the photographer may have clicked. The form allows the customer to place a detailed order. 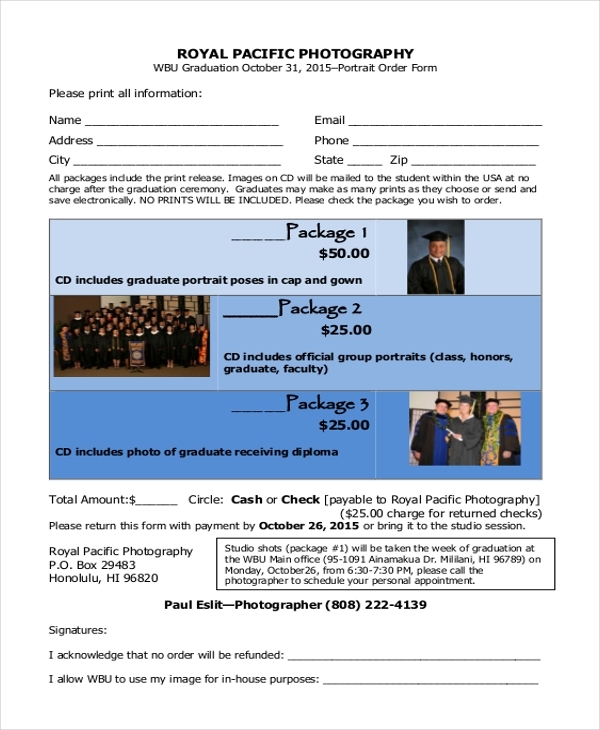 This is the type of photography order form that a photographer may use to attain orders for the prints of photographs that he may have clicked during an important event like a college graduation ceremony, etc. 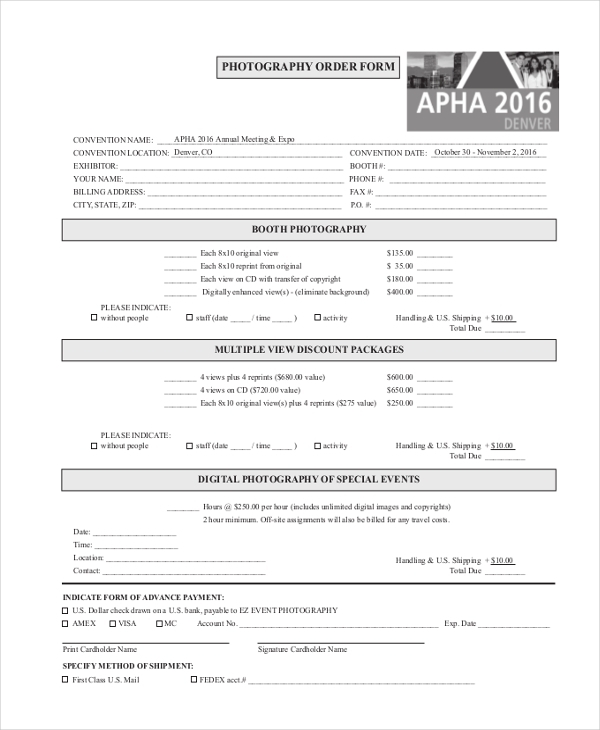 A photographer who was hired to click pictures at a professional sporting event uses this form to get a detailed requirement of photography prints that the organizers and participants need. Usually hospitals and clinics hire a photographer to cover certain events and facilities. 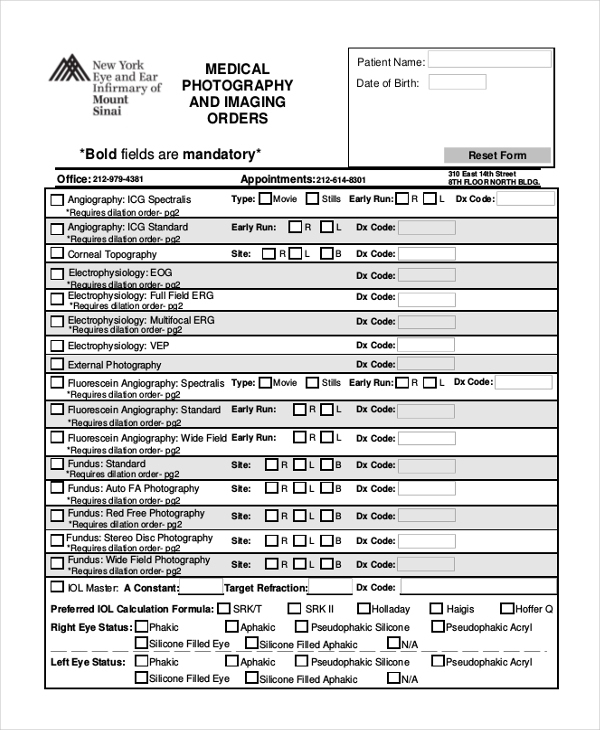 The photographer then uses this form to get an order from them for the number of copies that they require. This form is used by a photographer who may have covered a religious event. 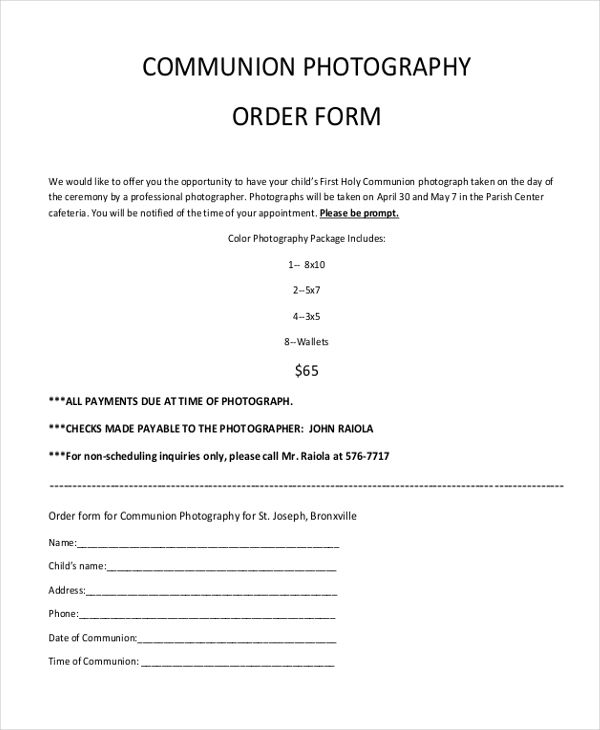 He issues this form to the church authorities and the participants to get their order for photographs. Whenever a party approaches a photographer to cover an event or function, he asks them to fill this form with all the relevant details. This helps to ensure that there are no last minute confusions. 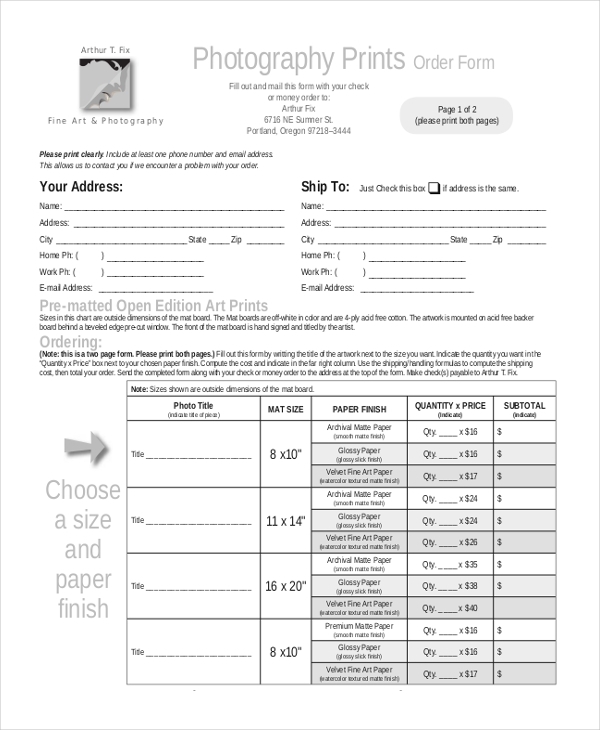 Who uses a Photography Order Form? 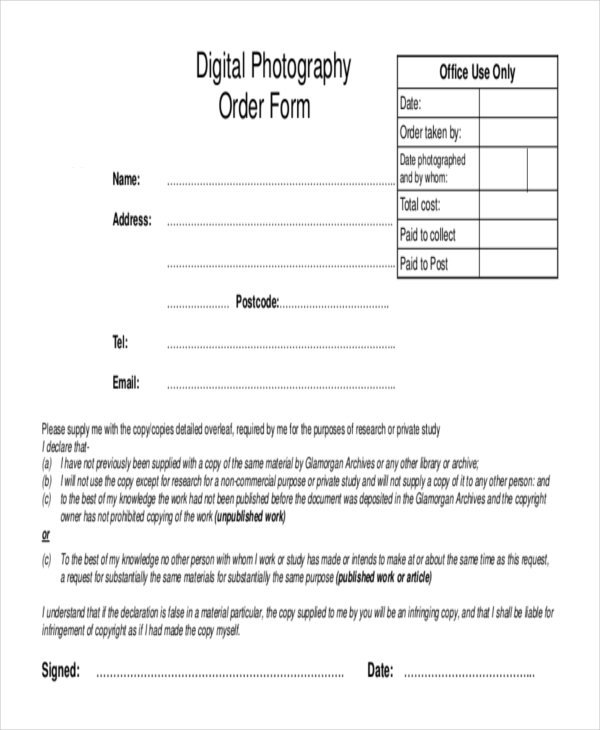 A photography order form is mainly used to secure a structured order from the customers as to the photographs they want to order and the number of copies they need. Thus, these forms are mainly used by people who may be into the business of clicking pictures and offering photography services. So, photography order forms are used by freelance photographers, professional photographers and photo studios. Useful Change Order Request Forms. Why Should One Use a Photography Order Form? Clicking a picture is definitely not an easy task. What is more difficult is to take an order from the clients. With thousands of photographs being clicked during an event and a number of people placing orders, the photographer might find it hard to keep track of all orders. However, with a photography order form, his clients can place orders in an organized manner by adding in the photo id number and the number of copies needed. This in turn makes it easier for the photographer to keep track of the orders and to deliver them on time. What Essential Segments should be Present in a Photography Order Form? A photography order form allows a photographer to take orders from his clients in an organized manner. Thus, the important segments that should be included in this form are name of the customer, address and contact details, details of the event, photo details and the number of copies needed. It could also contain the rate per photograph. You can also see Appraisal Order Forms. A photography order form can definitely make life easier for the photographer provided that it is designed in an efficient way. In case, you are not well versed in doing this, it would be a good idea to look for these forms online. You will find a wide range of photography order forms from which you can choose the one that would be perfect for you. These forms are easy to customize and ready to be printed.